Israeli Parliament Votes to Move Elections Up to April—will Netanyahu Win Again? 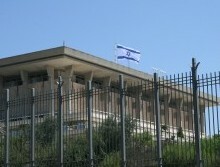 Israeli Knesset Building. Illustrative. By Joshua Spurlock. The Israeli parliament, known as the Knesset, voted on Wednesday to dissolve its current rendition and move elections up to April. A press release on the Knesset website said the vote passed overwhelmingly by a 102-2 margin. Just over four years since the last round of elections were held in March 2015, Israelis will be going to the polls again to determine if Benjamin Netanyahu will be able secure his fourth consecutive term as the leader of the Jewish State. So far, it looks likely. According to a poll earlier this week originally published by the Maariv Hebrew newspaper and reposted in English by The Times of Israel, Netanyahu’s Likud party would win more than double the number of Knesset seats as the runner up party—earning 30 seats compared to 13 for what was then a hypothetical new party to be created by former IDF chief of staff Benny Gantz. The Knesset is comprised of 120 seats, making 61 the threshold for holding a majority. The world is generally united against terrorism, but for some reason the supposedly moderate Palestinian Authority (PA) leadership is opposed to the United Nations condemning Hamas terrorism against Israel. The WAFA Palestinian news agency quoted a spokesman of the Fatah political faction that heads the PA as saying they “totally reject American-Israeli efforts to brand Hamas with terrorism at the UN.” Spokesman Usama Qawasmi further accused Israel—who has had to defend themselves against Hamas rockets and other violence aimed at their civilians—of sponsoring terrorism and committed to oppose “all hostile efforts to condemn” Hamas at the UN. 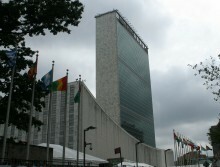 A resolution condemning Hamas terrorism, seeking to be the first of its kind passed by the UN, is backed by the United States and the European Union and references Hamas rockets and arson balloons . 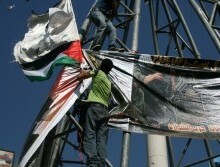 The resolution further calls for the Palestinian factions to reunite under the PA’s leadership. The US Mission to the UN said in a statement last Friday that the Palestinian representative at the UN requested a delay of a vote on the resolution from last week to next Thursday. In response, the US was clear on the importance of the vote. 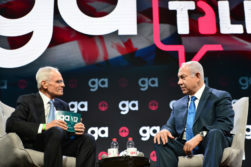 Netanyahu, in comments to the Jewish Federations of North America (JFNA) General Assembly published by his office, said he refuted a complaint from former US Vice President Joe Biden that a persistent Israeli security force in the Judea and Samaria region that would be part of a Palestinian state would prevent it from being a “fully independent state.” Netanyahu insists that Israel’s presence is necessary. Citing a failed model of operations and the failure of other nations to do their financial part, the United States on Friday announced they were cutting off all funding of the United Nations Relief and Works Agency for Palestine Refugees in the Near East (UNRWA). US spokesperson Heather Nauert said UNRWA’s considering future generations of Palestinians eligible “refugees” from the 1948 and 1967 wars, instead of just the people who actually fled those wars more than half a century ago, played a role in the US decision to start looking for other ways to financially aid the Palestinians besides UNRWA. “Beyond the budget gap itself and failure to mobilize adequate and appropriate burden sharing, the fundamental business model and fiscal practices that have marked UNRWA for years—tied to UNRWA’s endlessly and exponentially expanding community of entitled beneficiaries—is simply unsustainable and has been in crisis mode for many years,” said Nauert in a press release from the State Department. 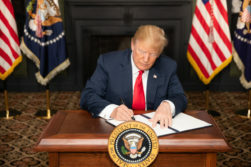 The United States’ plan to use economic sanctions to pressure the Iranian regime to change their ways is already bearing fruit—including a change in the regime. Economic Minister Massoud Karbasian was forced out of his position by a vote of no confidence by the Iranian parliament on Sunday, and the economic impact of the US sanctions played a role in that decision according to the Fars News Agency.